One of a fellow programmer came up with a question of “How do you create Smoke effect using Silverlight?” Well there may be plenty of code, third-party tools and plug-ins strewn over the internet for this, but out of a professional curiosity I got into the business of creating one out of my own hands. We need the smoke to be moving freely, so a canvas would be a best bet for the layout. Let’s think a minute about smoke, shall we? Smoke starts at a point, very concentrated (Generation Point). According to the complex laws of physics, it simply rises up becoming dilute all the way. Finally blending well with the air where it seems to disappear (Vanishing Point). Our approach would be to consider smoke as made up of small particles, which would originate at the Generation Point. These particles as time passes would simply rise up, becoming transparent by smaller percentages as it goes and finally becoming invisible at the Vanishing Point. These particles are going to be ellipses. Let’s have a method which does just that. Well, this is just one particle. By every tick of the clock, new particles should be generated to give the effect of the smoke billowing. This calls for a DispatcherTimer instance which would give me an event for say every 2 millisecond. At every tick, we need to be doing a set of tasks based on a few decisions. Firstly, we cannot afford to overload the memory/screen with infinite number of particles. 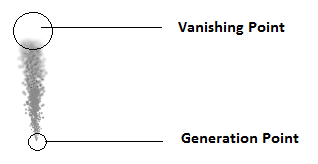 When a smoke particle simply disappears beyond the vanishing point, we can move them down to the generation point and reuse them. For this purpose, let’s have a limit of 1000 particles that can be freshly generated. If the screen has less than 1000 of them, we can go ahead and generate a new one. And take a wavy path up. Smoke particles take a simply chaotic path up, they just don’t go up in a straight line. Thirdly, Move every vanished particle back to its original point. Thus, was how we can generate a smoke effect in Silverlight using Particle System. With a minor change in the color and nature of the ellipse, you can create Fire or other similiar effects. Suggestions welcome from expert readers on alternate or even better ways!